There was just enough wind to fly a kite Sunday, if your kite was light enough. Full sunshine along with that light wind made for a great day to venture outdoors. A buddy and I got out for an impromptu afternoon of fishing Sunday, an idea shared by other sun-loving anglers this past weekend. We fished a watershed north of I-90, which isn't any different than all the other streams and rivers in southeast Minnesota right now - the water was low, cold, and crystal clear. We fished the same place we deer hunt, and we walked the same snow-covered (barely) trails the deer have been walking. There were no other boot prints streamside, which is a nice rarity in a mild winter. I tagged my first few brown trout of 2012, all of which took a size 14 orange scud. Despite a decent hatch of midges in the mid-afternoon warmth, the trout weren't interested in mine. There can be a lot more fishing than catching in the winter trout season, although there are exceptions to that rule. March can be amazing in the right conditions. It's rare you'll catch as many fish in January and February as you will from April through September simply due to colder stream temperatures and, in turn, lower metabolic rates of fish. But they still need to eat. Low, clear water works in favor of the fish too, and we're in the midst of one of the warmest winters on record in addition to a drought. -Fishing is catch-and-release with barbless hooks. -Not all streams are open for winter trout fishing. Check your maps first. Just because there is an easement doesn't mean you can fish there before April 1st. 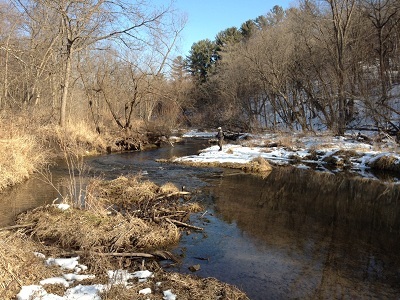 The DNR maps clearly label streams open for winter fishing. Here are maps for the Winona County area, Fillmore County, Goodhue County, and Houston County. -Keep a low profile and keep your distance. If you stand right over the hole you're about to fish, odds are you'll not catch any. Make your casts count. Once you've thrown a handful of casts at one pool, you've likely put the fish down for a while. Move on to the next fishy looking spot. -It happens, but it's not too often you'll be catching trout on dry flies in the early to mid winter season. Small nymphs and scuds fished deep with the help of a little weight tend to be more productive. -Have fun, dress for comfort and keep your hands warm. Flies have an uncanny ability to find the smallest of tree branches and you'll need to occasionally re-tie or re-rig your leader. Healthy list of resources from the Minnesota DNR. Randy Brock, a native Minnesotan from Litchfield, grew up hunting and fishing. As the Chief Meteorologist at KTTC-TV in Rochester, Minn., he now enjoys the fresh water springs and bluffs of the Driftless Area. Randy is a lifelong student of the outdoors, which feeds his desire to conserve this special resource. He enjoys camping with his family, fly fishing and hunting for upland birds and deer. We're already halfway through the catch and release winter trout season, and the weather's been agreeable. After years of bird hunting with other people's dogs, I decided it was time to take on the responsibility myself. Thankfully, I have a graceful and understanding wife.